The first of a five-part series I am doing this week as I look back at the making of Slayer’s Still Reigning DVD. From load in to load out, I was there with the band. For years, Slayer had wanted to perform their classic album, Reign In Blood, in its entirety for their fans. Jeff Hanneman, one of the visionaries of the band, wanted to take it a step further. His dream was to somehow have the band perform the closing track, Raining Blood, onstage while a shower of blood rain poured down on the band. I got the call from management, it was time to make Jeff’s dream a reality…and it was happening in just a few days – Augusta, ME of all places. 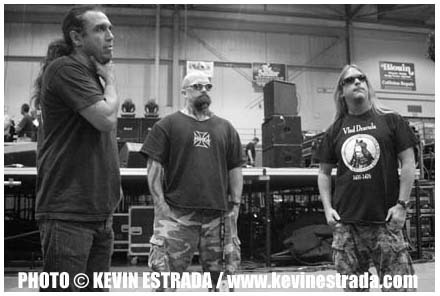 Slayer was on the Ozzfest tour and planned an off-day show in Augusta. Slayer wanted this show to be an event: First – Slipknot, Hatebreed and God Forbid were all on the bill as the openers (amazing in its own right); Second – Slayer was playing a full set, then as their encore, playing the entire Reign In Blood set; Third – if that was not enough, Slayer was going to somehow make the impossible possible and have it pour and shower blood during the final song of the night. No one knew exactly how to make the bloody rain work, or if it was going to work at all. They only had a few days to figure this gimmick out, build it, and to pull it off. To make things even more stressful was the decision to film this show for a home DVD. There would only be one chance to make this happen, no practice runs, no re-shoots. The crazy thing is, from my experience in Slayer World, things always seem to work for the best when things are rushed and done at the last minute. Don’t ask me why, but it is true…the more stress and the less time, the better the outcome. The band flew me in the night before and I arrived at the venue around 10am. They wanted me to document as much as I could that day (you can see a lot more of my photos in the Still Reigning DVD packaging). When I got there, it was mass chaos outside, behind the venue as teams of riggers, plumbers, special fx crews, stage managers, etc. all put their heads together to figure out how to build a contraption that would pour blood on the band, then cover the entire stage with a constant, steady shower of blood rain. Also, this contraption needed to be built in a way that the band could still play their instruments, they needed to avoid flooding the stage and, most importantly, it was important to not get the crowd showered in blood in order to avoid any lawsuits. There was a lot to accomplish and it was just hours before the show and nothing was built, the plans were still being worked on. Needless to say, there was a lot of tension from the band, management, the DVD production team and the venue. These photos really capture the stress of that day. Everyone, including the band, were questioning whether or not this was a good idea. 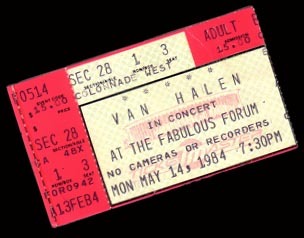 Part five of a five-part series that I am doing this week on local L.A. bands in the ‘80s that were opening acts on some big gigs at my favorite venue as a kid – Perkin’s Palace in Pasadena California. Witch was another credible metal act from Los Angeles. 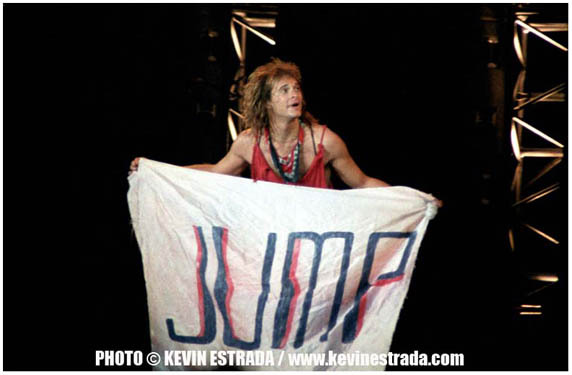 Formed in 1982, they had instant street cred thanks to their drummer, Punky Peru, who was great friends with Motley Crue’s Tommy Lee and was also asked to join W.A.S.P. At some shows, Punky would slice and punch his face until it was dripping blood – compare that to Blackie Lawless who was still drinking fake blood from a skull. Not only did Witch have a loose canon for a drummer, but their singer, Peter Wabitt, was also a bit of a madman on stage. Wabitt’s vocals were dark, eerie and powerful. Another aspect that I thought was really cool about Witch’s live show was their guitarist, Ronny Too. 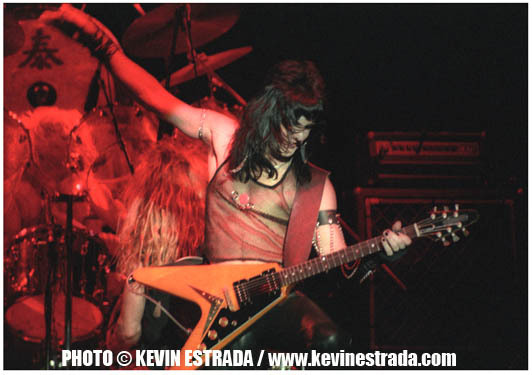 I love Flying V Guitars, they just look so metal, and Ronny would always bust them out. Witch played some big gigs in their career, headlining over such local majors as Slayer and Lizzy Bordon. But this show at Perkin’s Palace proved to be a huge show for Witch. 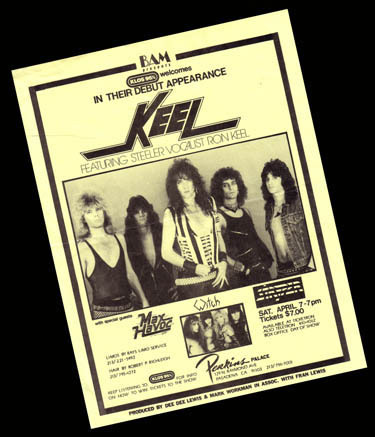 Witch was direct support for the debut performance of Ron Keel’s Keel, following the breakup of Steeler. Ron Keel was the hottest unsigned name in Metal in L.A. at the time and needless to say, there was a lot of hype on this show and it was packed to the rim. Witch was just about to release their EP, The Hex Is On, and the Los Angeles rock radio station, KLOS, had just premiered a few of their songs, including the show-stopper, Damnation, on The Local Music Show a few nights before the show. KLOS had also premiered a few of Ron Keel’s new solo songs – the L.A. Metal Community was thirsty to hear more from all of the bands on the bill. I remember looking up at the balcony that night and seeing hands, arms and bodies hanging over the edge. It was definitely an oversold show. 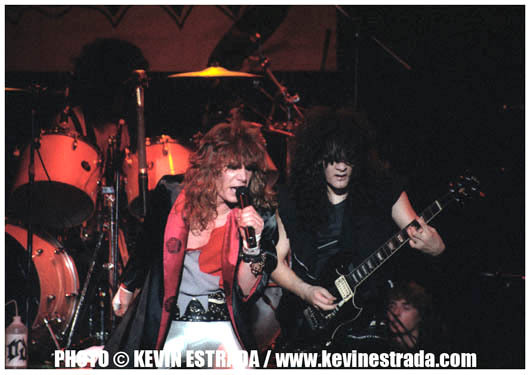 Here is one for the fans: this show at Perkin’s Palace was produced by DeeDee Lewis, who would later marry Ron Keel…kinda’ cool how things work out sometimes. Part two of a five-part series that I am doing this week on local L.A. bands in the ‘80s that were opening acts on some big gigs at my favorite venue as a kid – Perkin’s Palace in Pasadena California. It isn’t often that a bass player is the body and soul of a band…but like the band Talas, this was an exception. Bassist Rik Fox had just been let go from L.A. “should have beens”, Steeler. Fox, who was also in the first generation of WASP (which he also penned the band name) knew just about every big name in the Hollywood rock scene. With Steeler and WASP now behind him, it was time for Fox to form his own band – SIN. Musically, SIN’s approach was a cross between Angel and Judas Priest. The line-up was made up of relatively unknown L.A. players: Carl James (drums); Howard Drossin (guitar); Vince Gilbert (keyboards); and Art Deresh (vocals). Art Deresh was a pretty good singer, but there was a big rumor going around that he was hygienically challenged. In other words, this guy was ‘stinky! People complained and talked about it all the time. Unfortunately, I discovered this for myself first hand one night at an after party at his home…that was some wicked B.O.!! SIN quickly became one of the fastest rising new bands on the L.A. rock scene, playing a handful of gigs at Perkin’s Palace. Having Rik Fox and SIN open for his former band Steeler that night at Perkin’s Palace was a bold move by the promoter. There was a lot of tension and a lot of curiosity in the audience – this could have opened up a huge can of worms. All the bands killed that night. It was another amazing lineup and quite a bargain at only $7.00. 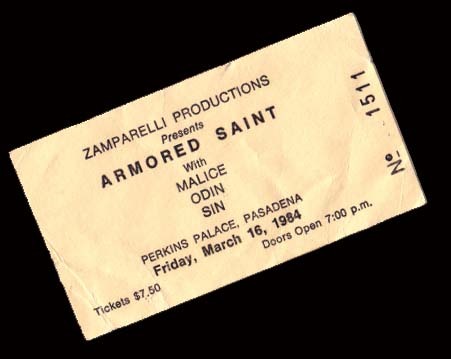 Part one of a five-part series that I am doing this week on local L.A. bands in the ‘80s that were opening acts on some big gigs at my favorite venue as a kid – Perkin’s Palace in Pasadena California. First, a little background on the venue. The Raymond Theatre was a beautiful 2000 capacity theatre built in the 1920’s. Vaudeville shows, movie screenings and live plays were the original uses of the theatre. In 1979, the venue broke into the live concert market and the theatre became known as a live venue named Perkin’s Palace. An incredible list of artists have performed on the Perkin’s Palace stage : The Cure, Motley Crue, Phil Collins, Black Flag, Bad Religion, Depeche Mode, The Ramones, and many, many more. Growing up as a teen, I went to a lot of amazing shows at Perkin’s Palace. Luckily for me it was only about 20 minutes from my home and I could usually talk my Mother or my pal Erik into driving to some of the early shows. The ticket prices were low and you always got a handful of L.A.’s best bands – handpicked by Gina Zamparelli, who had to be the greatest promoter in L.A. in the 80’s. When Gina’s name was on the flyer or on the ticket, my pals and I knew that every band, whether we had heard of them or not, were worth getting to the show early for. Steeler was super-buzzing at the time. They had an incredible LP out on Shrapnel Records and the band was filled with talent. 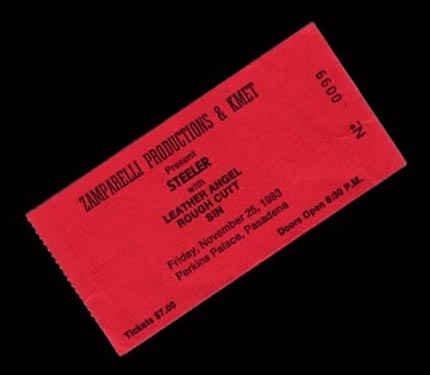 The openers for that night – Leather Angel, Rough Cutt and SIN were three of the coolest up and comers in town. 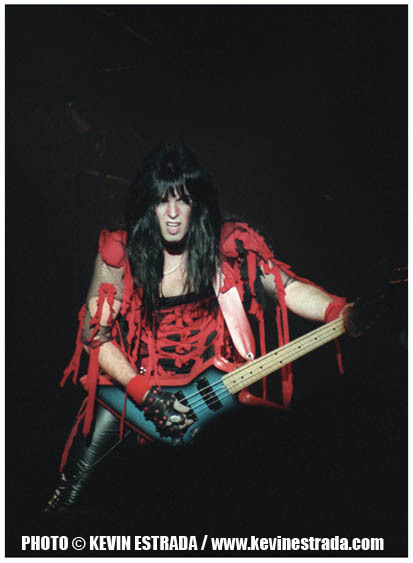 SIN was the brainchild of bassist Rik Fox, who had just left Steeler to form his own band – there was some competitive energy that night. 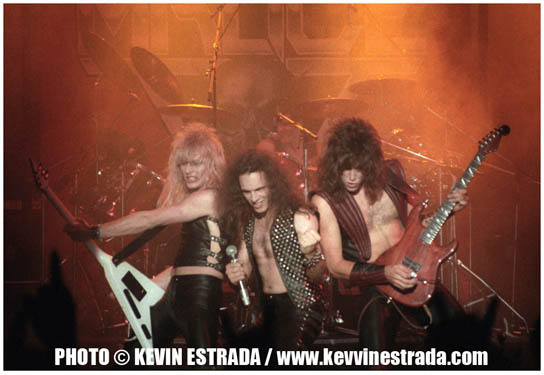 Rough Cutt had just been picked up by Wendy Dio (Ronnie’s wife) for management. 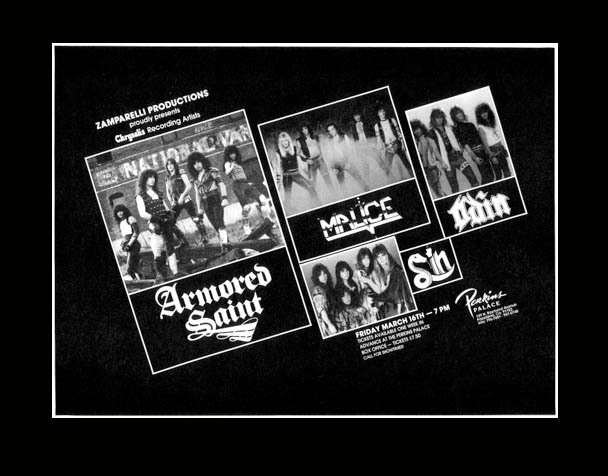 Leather Angel was an all female heavy metal band, they really stood out in terms of Local Metal Bands in Los Angeles. I first saw them as Obsession when they opened for Motley Crue at Perkin’s Palace the previous year. Motley had taken a liking to them and that helped to build their street cred in L.A. Soon after, legalities arose with another band using the same name and the girls were forced to rename the band to Leather Angel. The band was fantastic both live and on record. They kept up and played with the best of L.A.’s Metal acts – Ratt, Motley Crue, Steeler, Black & Blue, etc. Their EP, We Came To Kill, was a solid release with some local radio airplay. The record proved that this band was just not a bunch of good looking chicks, these girls could rock and they were serious about it. Leather Angel later went through a handful of lineup changes and changed their name to Jaded Lady. Jaded Lady’s claim to fame was their appearance in Penelope Spheeris’ 1988 film, The Decline Of Western Civilization Part II: The Metal Years. You are currently browsing the the KEVIN ESTRADA blog blog archives for June, 2008.